In this March 30, 2011, file photo, killer whale "Tilikum" appears during its performance in its show "Believe" at Sea World in Orlando, Florida. "Tilikum" killed 40-year-old trainer Dawn Brancheau at the marine park on February 24, 2010. SeaWorld and two former executives have agreed to pay more than $5 million to settle fraud claims that they misled investors over the negative impact the 2013 documentary "Blackfish" had on business. The Securities and Exchange Commission on Tuesday announced the proposed settlements which are subject to court approval. 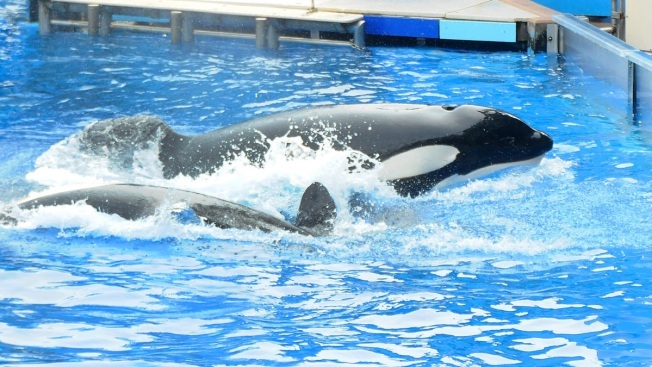 The SEC's complaint alleged SeaWorld and former CEO James Atchison made misleading and false statements or omissions in SEC filings, earnings releases and calls about the documentary's impact on the company's reputation and business. "Blackfish" chronicled the life of Tilikum, an orca that killed a SeaWorld trainer during a performance in Orlando in 2010. After the movie's release, SeaWorld faced a declining stock price and attendance. A SeaWorld spokesman says the company neither admits nor denies the allegations under the settlement.